Abstractions of delusions: Drafting like riding a horse.. Drafting like riding a horse.. Anyone with both experience in riding a horse and drafting? 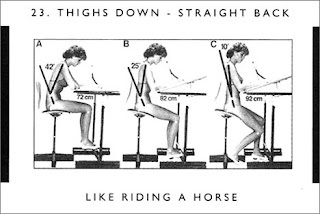 Is it “Like riding a horse”, am not too sure about the riding part but it sounds as if they’re sending the wrong message: “Drafting is like riding a horse in your bikini.”.